Last Wednesday was Ash Wednesday, and I was glad to see the Cathedral packed for noon Mass. I spoke about the need to do something for Lent, and not just put off making a resolution. I also encouraged us to do our Lenten sacrifice out of love for Him, who first sacrificed for us. 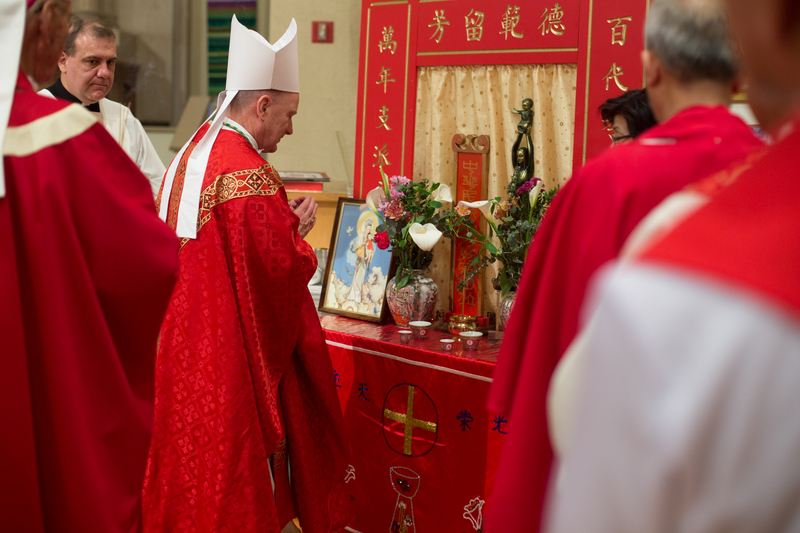 You may read the text of my homily here. 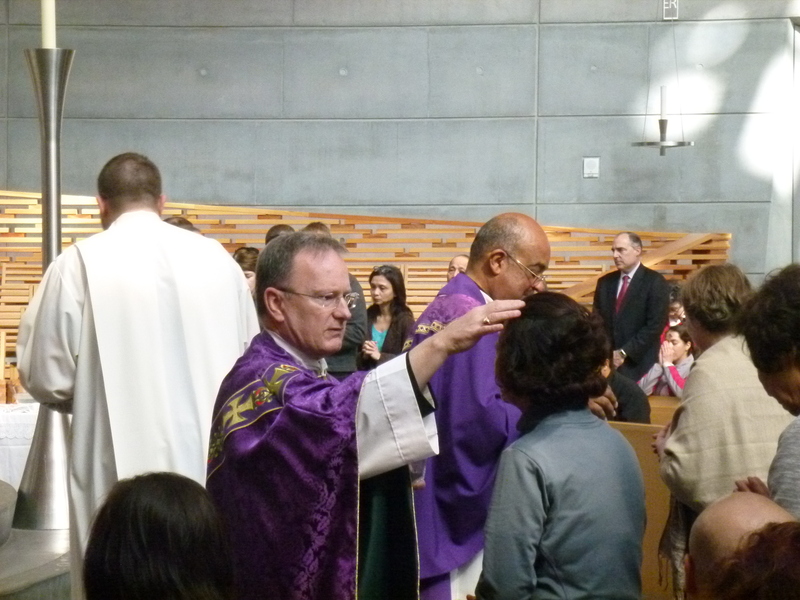 I was pleased the Oakland Tribune featured a prominent photo of our Ash Wednesday Mass the next day. They also had a very fine article recently on Father Jay Matthews appointment as the new Rector of the Cathedral. See it here. Nice to get some good publicity for the Church from our local media. In continuing my visits to our parishes for our Capital Campaign, I went to Queen of All Saints in Concord. Fr. Michael Cunningham and Fr. Enrique welcomed everyone for a totally bilingual reception. It was good to see such a large turnout from both language groups in the parish. We are one family in Faith. I spent last Friday morning at the Marines Memorial Theatre in San Francisco for the annual Memorial Service for over 120 deceased service members from Northern California. This non-denominational service, sponsored by the “Blue Star Mothers” is held to help the parents of the deceased find support and help in their grief. There were a number of parents present from our Diocese. Here I am with Elsie Silva from St. Anne’s in Union City, who lost her son Lance Corporal Andrew Silva, USMC, last year. Please remember the souls of our deceased service members, as well as their families, in your prayers. The horrific murder of 21 Coptic Christians in Libya a week ago came as we began the Journey of Lent. The next week on Ash Wednesday throughout the Diocese we wore the ashes of Penance on our foreheads, the sign of the Cross and of our faith visibly proclaimed to the world. Those Christians in Libya were killed simply because they confessed Christ and his Cross. Please join me standing together united with all Christians in prayer for our brother Copts, the newest martyrs. 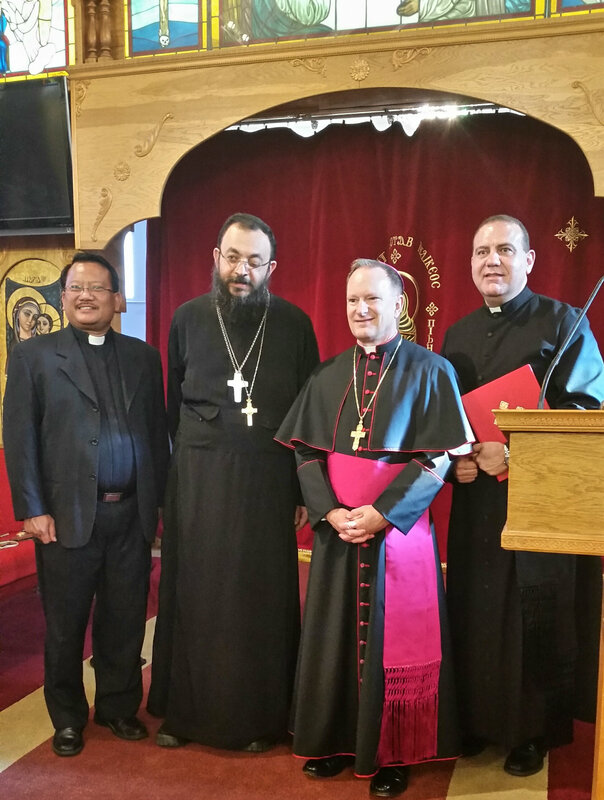 And so last Friday I went to visit Saint Antonius Coptic Orthodox Church in Hayward to express condolences on behalf of everyone in our diocese on the murders in Libya. Fr. Ramon Gomez and Fr. Alex Castillo accompanied me and we were greeted very warmly by Fr. Bishoy Ray Ibrahim. I assured him that the Catholic clergy, religious and laity of the Diocese of Oakland stand one in faith and in solidarity with the world Coptic community. We prayed together for the protection of religious freedom and of practicing the faith, and I asked Fr. Bishoy to deliver a letter from me to his patriarch His Holiness Tawadros II, Pope of Alexandria. He agreed to do so and then invited me to read my letter to his congregation assembled for the Friday afternoon liturgy. You can read my letter here. Fr. Bishoy and I exchanged our blessings and then exchanged gifts as well. 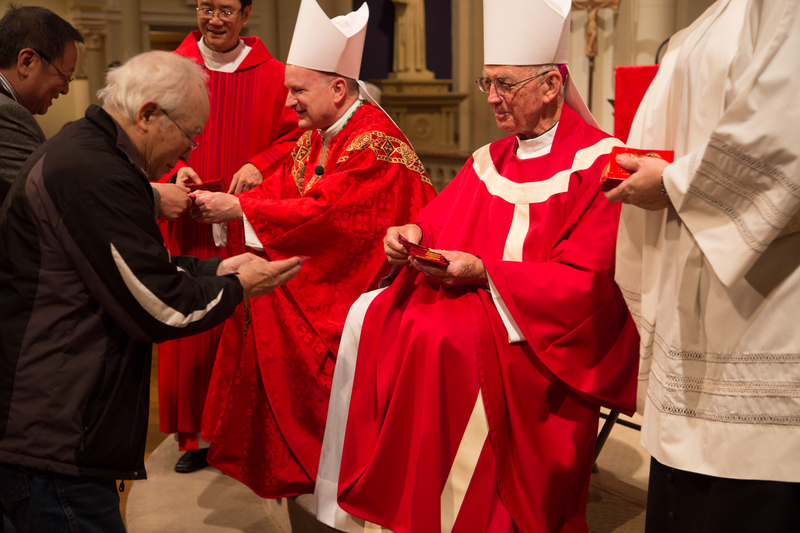 In the name of the Diocese I gave him the pectoral cross of The Good Shepherd which is worn by Pope Francis. Fr. Bishoy presented each of us with a warm loaf of leavened altar bread (unconsecrated) used in their Eucharistic service. Straight from the oven! The next day during evening Mass at the Cathedral I recounted this visit during my homily, which is linked below in the section on the FACE benefit. 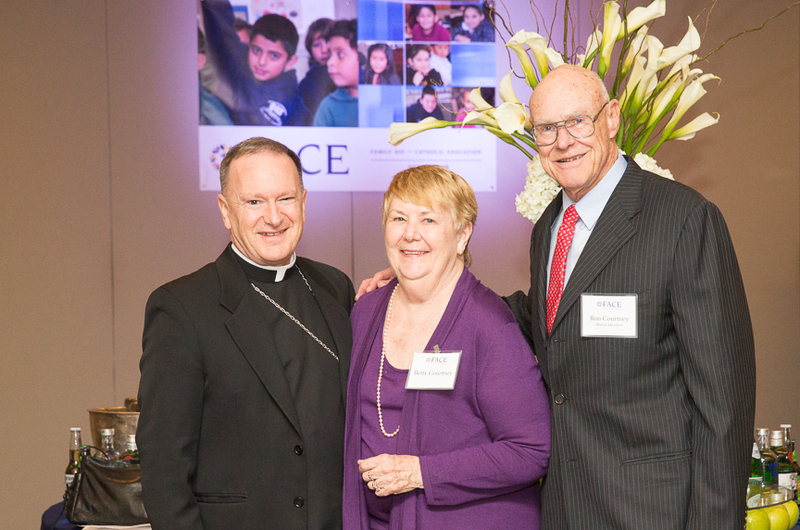 This weekend we had a special Mass and reception for FACE, Family Aid for Catholic Education, to thank our benefactors. These generous people contribute to a scholarship fund helping our students pay tuition at our Catholic Schools. Part of the funds raised in the Capital Campaign will go to creating an endowment for tuition assistance for Catholic Education. At the reception I was pleased to present Ron and Betty Courtney with the first Founders Award for their leadership and generosity. You can listen to my homily here. This past weekend we had three large ceremonies, the “Rites of Election” to recognize Catechumens (those who are going to be baptized at Easter) and Candidates (those who, having been baptized are going to receive more sacraments, or those baptized in another Christian church who are converting to Catholicism). 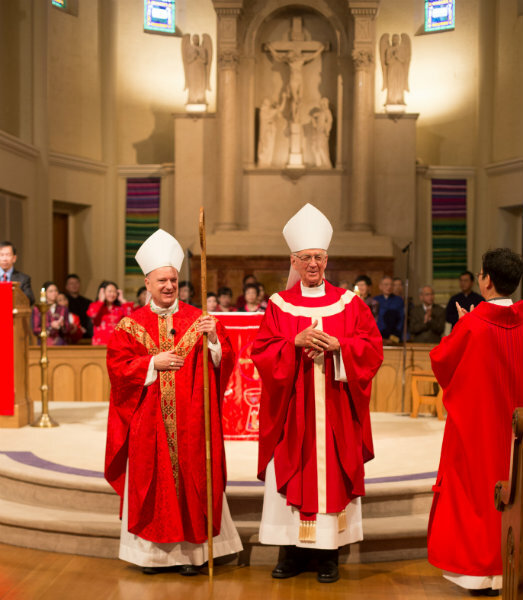 When you see the Cathedral filled “times 3” it shows how alive and well the Catholic Faith is in our diocese. 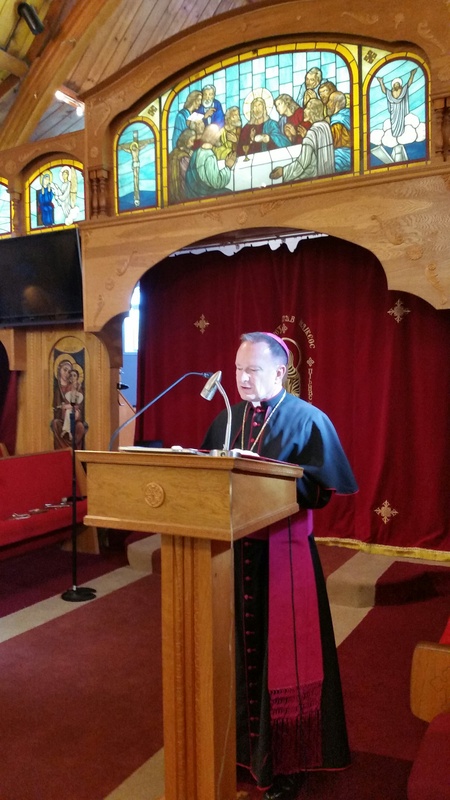 In my homily I spoke about the witness of the Coptic Christian Martyrs in Libya. 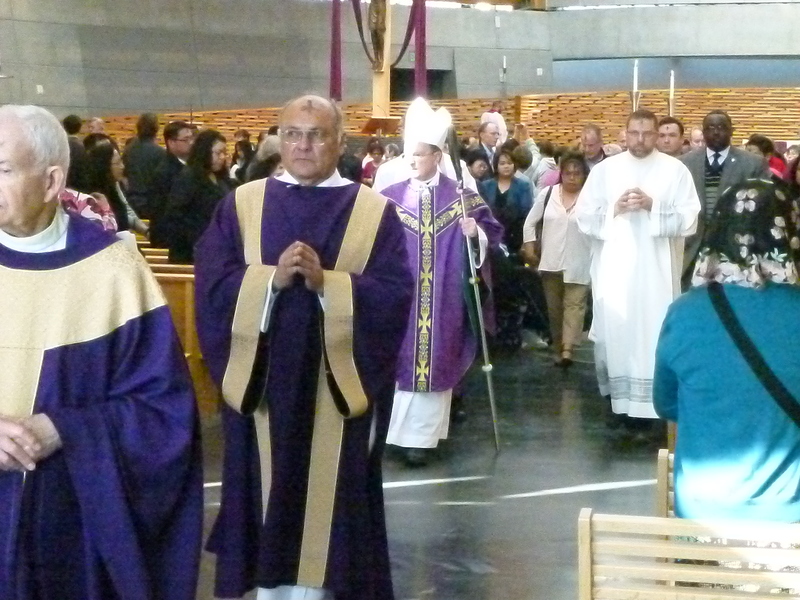 You can listen to the homily in English or in Spanish. 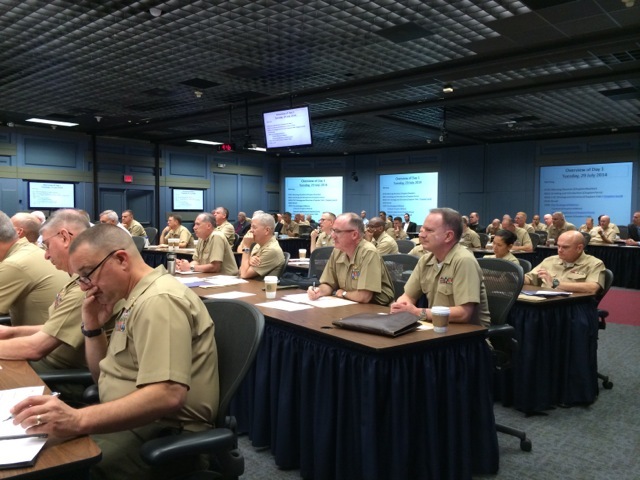 This week I am attending the Senior Leadership Symposium for all the chaplains of Captain-rank in the Navy and Marine Corps. We’ve been briefed by the Chief of Naval Operations, the Commandant of the Marine Corps, and the Assistant Secretary of the Navy. We’re learning not just about world affairs and US defense strategy, but also how to better provide pastoral ministry to our sailors and Marines. The Armed Forces are very short of Catholic chaplains. I am one of only six priests representing the Catholic Church at such an event, where 20 years ago there would have been around thirty. It’s a good way, though, to catch up with old friends — from all denominations — as most of us have served together in the Navy for more than 20 years.